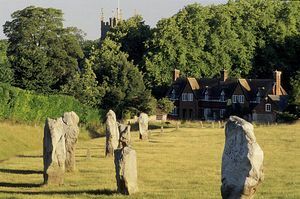 Famously overshadowed by its better known neighbour, Stonehenge, the Avebury Stone Circle has a great deal to offer. Dating back some 4,500 years it is a thought-provoking structure prompting the questions of who, why and how in any curious visitor's mind. Avebury is one of the largest stone circles in the world, measuring a quarter of a mile (427m) across, and it is open for visitors (and sheep!) to wander right up to and among the stones, which makes it far more tangible and impressive than the roped off stones at Stonehenge. massive ditch. The plateau would have been 17m (55 feet) above the original ditch bottom. 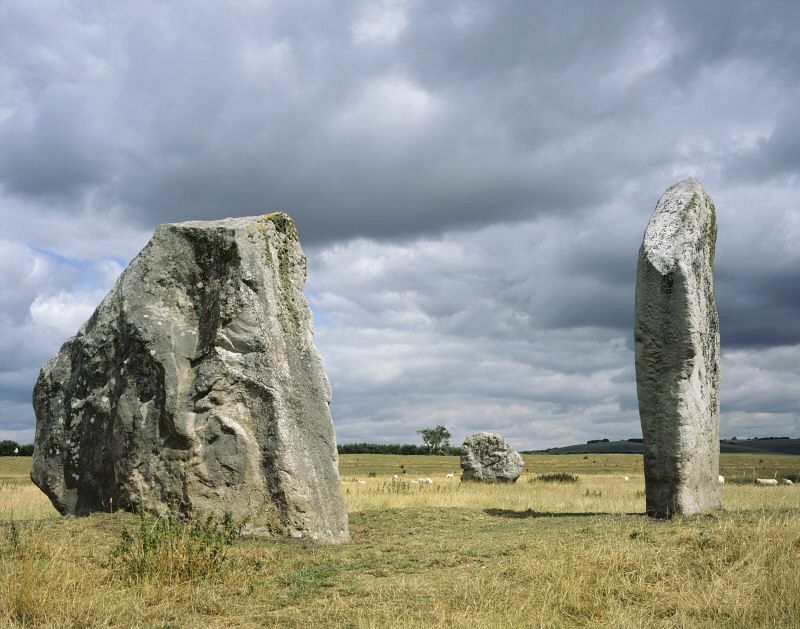 These huge stones, each weighing 40 tons or more, were left rough rather than "dressed" and like Stonehenge they were sourced from the Marlborough Downs which are close by. They are either pillar or diamond shapes and the circle is thought to have been a religious and ceremonial monument for fertility rituals or for celebrating the solar seasons. Unfortunately many of the original large stones were broken up and used to construct the nearby village cottages. Some of the stones have individual names and histories. Perhaps most interesting and extraordinary is the Barber's Stone. During the 1300s some of the stones were buried in pits. Apparently a pit was dug for the stone but it fell over unexpectedly, killing a man. His body lay undisturbed for centuries. When it was finally discovered, a lancet, scissors and three silver coins lay next to the skeleton, all the trademarks of a barber-surgeon at that time. Chair reputedly has mystic powers. This ancient ritualistic circle of monoliths partially encompasses the pretty village of Avebury. It was only excavated in the 1930s by archaeologist Alexander Keiller, heir to the Keiller marmalade dynasty. It is now listed as a World Heritage Site. Other finds which were unearthed are on display in the 17th century farm buildings which provide a setting for the small but fascinating Alexander Keiller Museum. Visitors may be interested in tracing the remaining ceremonial avenue of standing stones leading from the main circle. The West Kennet Avenue was originally 2.5km (1.5 miles) long and ran from Avebury to the smaller Sanctuary stone circle at Overton Hill. 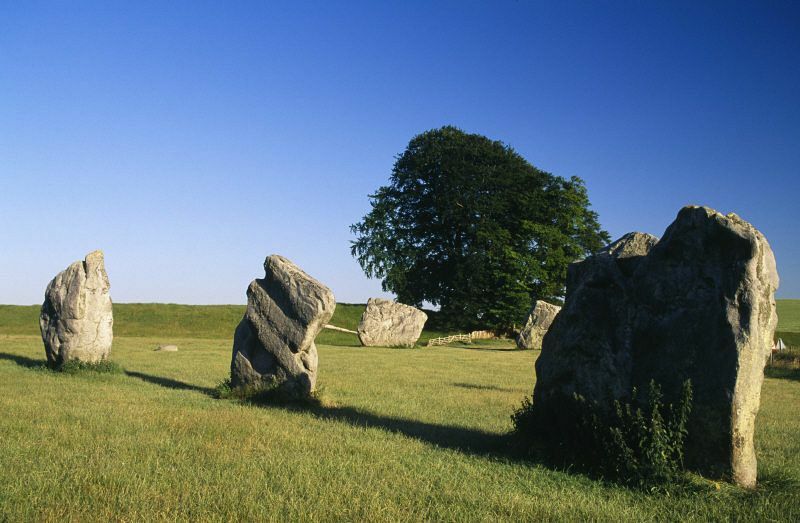 Other interesting sights at Avebury include the manmade conical Silbury Hill, East and West Kennet Long Barrow burial sites and the Bronze Age burial mounds at Windmill Hill which are all within easy walking distance from Avebury Stone Circle. As usual there is a National Trust shop and an on-site restaurant which is incidentally the only vegetarian restaurant run by the National Trust.